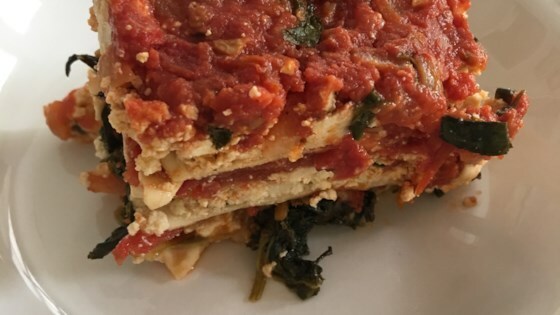 "This lasagna is VERY good and is also a vegan recipe." Assemble the lasagna: Spread 1 cup of the tomato sauce in the bottom of a 9x13 inch casserole pan. Arrange a single layer of lasagna noodles, sprinkle one-third of the tofu mixture over the noodles. Distribute the spinach evenly over the tofu. Next ladle 1 1/2 cups tomato sauce over the tofu, and top it with another layer of the noodles. Then sprinkle another 1/3 of the tofu mixture over the noodles, top the tofu with 1 1/2 cups tomato sauce, and place a final layer of noodles over the tomato sauce. Finally, top the noodles with the final 1/3 of the tofu, and spread the remaining tomato sauce over everything.